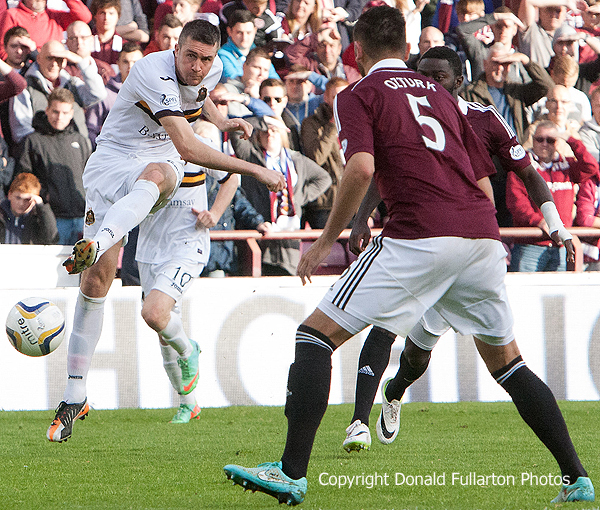 DUMBARTON were no match for SPFL Championship leaders Hearts in front of a 15,000 crowd at Tynecastle. There was no repeat of the 0-0 heroics against Hibs the previous Saturday, and Sons six game unbeaten record came to a shuddering halt when they lost 5-1 to a very talented home side. However manager Ian Murray, a former Hibs star, who was the target for chants from the crowd throughout, must have been pleased that the defence held out for the first 25 minutes. However the home side went ahead when Osman Sow headed home past keeper Danny Rogers from close range. Soon after Andy Graham had a shot well saved by keeper Neil Alexander. On 39 minutes Hearts went 2-0 ahead when Scott Linton tripped Billy King, and Prince Bauben converted from the spot kick, despite Rogers nearly parrying it away. After the break they kept up the pressure, with pacey attacks and breakaways, and they went 3-0 up as defenders backed off Jason Holt who netted his first goal of the season. However in the 73rd minute Sons struck back. A corner from Jordan Kirkpatrick was headed across goal by Colin Nish and hit home by Garry Fleming. Any hopes of a revival were dashed when Hearts full back Callum Paterson headed home no.4 on 83 minutes. Four minutes later another counter attack ended with a long range strike from Billy King making it 5-1. The picture shows Colin Nish sending in a shot.